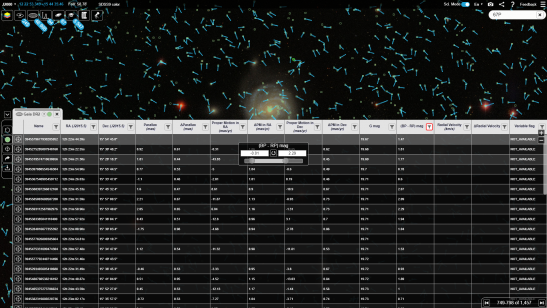 ESASky is a website that gives users a single interface to access data from all ESA telescopes as well as an ever increasing list of telescopes from other institutions like JAXA, NASA, ALMA, and ESO. Previously, users had to navigate to the archive of each telescope, which often vary greatly in both functionality and appearance. They also needed to have technical knowledge of the specific telescope to be able to access the data. 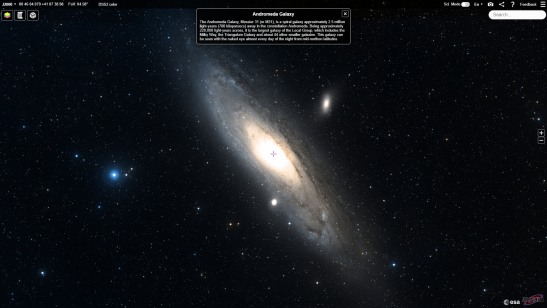 ESASky provides a simple and powerful, user friendly website utilizing extensive visual feedback, where no in-depth technical knowledge of every specific telescope is needed. 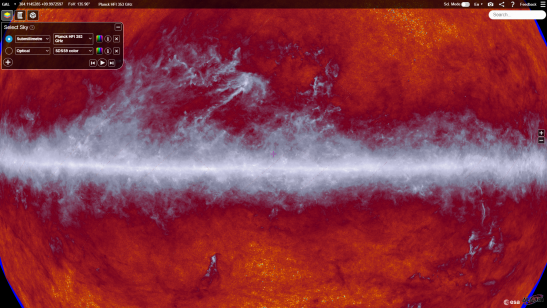 The website provides easy-to-use, visual navigation through progressive all sky maps (called HiPS). This allows users to either navigate to the desired location or just search for it in the powerful search box. Users can then see all available observations and publications as well as all catalog and spectral data in the chosen region. This opens the possibility for users to discover new data that they may not have been aware of before, which is especially likely for the high number of scientists that have specialized in a smaller part of the wavelength spectrum. Users can work with the petabytes of available data inside ESASky, send it to another application, download the data products in the form of FITS files, or download the entire table. 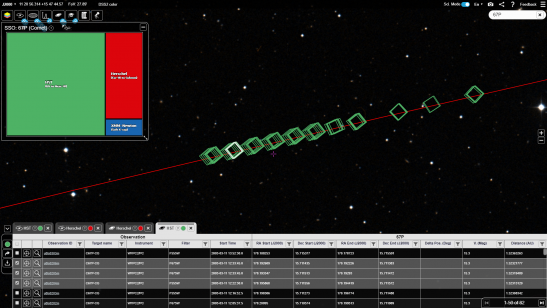 The exact area of the observation is shown as an interactive footprint on the all sky map to give users a visual indication of the extent of each given observation. 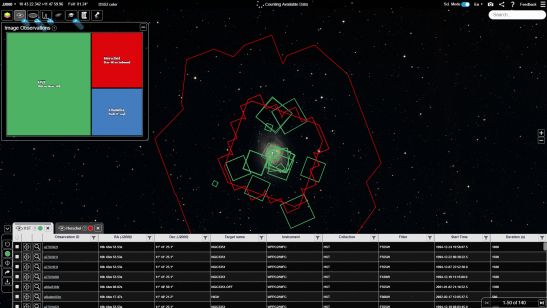 Other powerful features include the Solar System Objects (SSO) feature, wherein a unique cross-match algorithm has been developed. 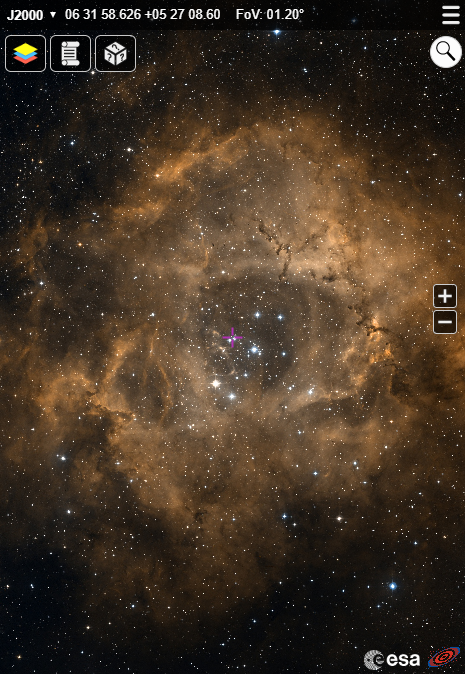 This algorithm finds all occasions when an SSO’s orbit entered the field of view of a telescope at the moment of the observation. 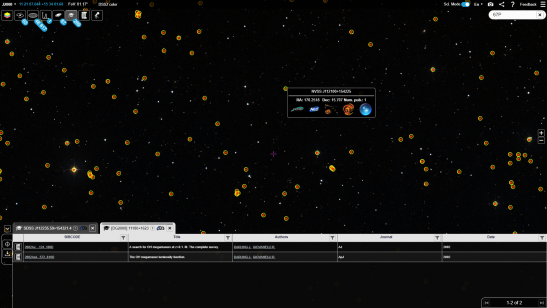 Try it by searching for your favorite solar system object! 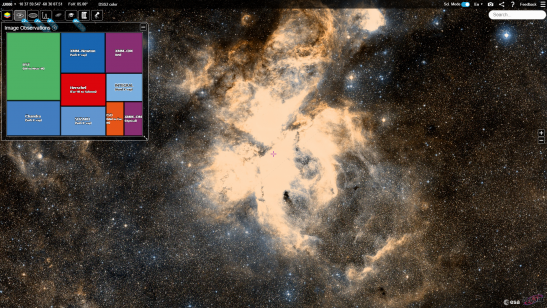 Other gems of the applications are the visualization of proper motion as measured by the different mission catalogs and the observation planning tools for the upcoming James Webb Space Telescope, as well as a fully responsive design giving users with smaller screens, like mobiles or tablets, the same user friendly experience as desktop users. Users with more technical knowledge can also utilize ESASky’s powerful Python interfaces, PyESASky and ESASky’s module in Astroquery. PyESASky allows users to use ESASky’s client in their Python projects and integrates nicely with things like Jupyter. Users who don’t care about the client features can either use ESASky’s TAP server directly or the ESASky module of Astroquery where all data hosted by the ESASky servers are accessible via a Python command line interface. All this sums up to an application that is leading in its field and enables science exploitation like never seen before in the astronomy scene. Go to ESASky here or read more on the help pages here.